Far too often debates over development aid follow the contours of ideology - either (global) capitalism is evil and must be stopped, or the poor are just welfare scroungers who have to be saved from aid by free-markets. As a result we get an unhelpful myopia - arguments are ideologically driven and make only partial contact with the evidence, and divisive rhetoric - the real enemy is not poverty, but one's ideological opponents. Think William Easterly's 'White Man's Burden' or Naomi Klein's 'No Logo'. So do philosophers do any better? Thomas Pogge's 'World Poverty and Human Rights' is one influential but disappointing recent attempt. basic human needs because of the global order imposed by us (the rich) which is a harm we have a duty to stop or mitigate. Step 3) piecemeal solutions - end countries; promote democracy; tax resource extraction to fund aid; introduce a new patent system which pays out according to how many lives a treatment saves. Commit to increasing economic production and ensure distribution of economic gains to the poor (i.e. industrialise! see e.g. Ha-Joon Chang). There is an almost complete lack of political-economy in Pogge's book. That means that he never manages to identify the specific causal connections between certain global institutional arrangements and avoidable poverty. And it means that his solutions lack realisticness and bite. (With the notable exception of the excellent patent proposal, which is realistic and could do a lot of good, but still exemplifies his focus on avoiding any engagement with the 'illegitimate' local governments and institutions of the poor world. Actually Pogge doesn't really trust any governments). For example, his analysis suggests that the rich world benefits from the present order's harms to the poor (the zero-sum game delusion) - no we don't (though certain vested interests do, just as with the Atlantic slave-trade), but good global governance is a public good and is undersupplied. He promotes democracy as a magic bullet, but only considers elections, rather than the democratic institutions (free press, civil society, constitutional checks, etc) without which democratic politics turns into patronage funded by rentseeking (see Nigeria, Kenya, etc for object lessons). Pogge is a brilliant philosopher, deeply sincere, and committed to helping the poor world (this is even clearer when you meet him in person). But moral theory is not enough: it simply lacks the conceptual resources and imagination to adequately understand the context-embedded nature of poverty or provide guidance on escaping it. In trying to grasp something so inherently multi-faceted and complex, any moral theory must discipline, straighten, and flatten a tangled moral landscape into a simplified form, and hope the distortions thereby introduced are unimportant (and if you still don't see why that may be problematic, consider the IMF's much criticised 1990's Asian interventions, which followed from its own simplified and abstract economic theory). But Pogge's brilliant moral philosophy does distort in a significant way. Pogge believes that we not only have a positive duty to help the poor (which is notoriously difficult to pin down), but have broken a negative duty not to harm them (much worse than not helping as much as we could) because we, the rich world governments, have set up global institutions that harm the poor world. That is crucial for his argument because it makes our obligations unavoidable and clearer (reform the global order). As a polemical point - simplification and exaggeration for the sake of political persuasion to get people to do good things - that seems justifiable. But insofar as this moral theory is supposed to truly capture the moral landscape it is disturbing. For underpinning that well-intended rhetoric is a troublingly patronising morality play in which the poor world is characterised as the helpless victims of our greedy oppression and the solution is the expiation of our sins by ritual self-flagellation and blood money (Peter Singer's shallow pond parable all over again). Really then the story is all about us, as usual, and not about the poor. We have agency, knowledge, power, politics, morality and collective responsibility. They exist only as statistics (death rates, income inequality, etc) and their role in the play is to suffer: corrupted by our greed, killed by the bullets we sold them, etc. Our successes are stolen from them, their failures are imposed by us. Contrast this closed theoretical approach with the helpful but humble perspective of a real political economist - Paul Collier, formerly director of the Development Research Group of the World Bank. 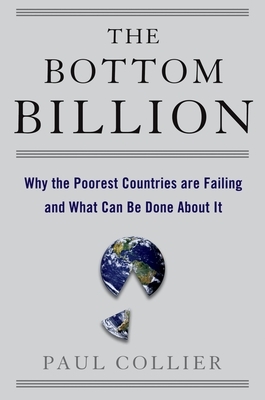 His 'Bottom Billion' makes extensive use of econometrics and his practical experience of the political economy of the developing world to cut through the armchair debates about what does and doesn't cause poverty and how much. Collier takes it for granted that we have a duty to help (he is scathing in his criticism of rich-world protectionism), but his analysis of how we can do so begins with the political economy of poverty rather than Pogge's moral economy. Surprisingly enough (!) continued poverty has multiple causes and cannot be straightforwardly solved by aid, free markets, simple transformations of the world order, or even democracy (although these are all important). Poverty is the default state for human history, and while 5/6 of us have either escaped or are on stable paths out of it, 58 countries with 1 billion people are more or less stuck in 1 or more of 4 traps - conflict, natural resource curse, landlocked, or bad governance. Collier confronts us with the real scope of the difficulties in ending poverty: its solutions must be sought, explored, and fought for out in the real world by multiple actors. It is not purely or mainly a matter of changing the hearts of rich world citizens. The rich world does have various instruments which we can and should use to help countries, mainly to help themselves (they have politics too). But these tools have to be deployed sensitively and moderately (e.g. too much aid, at the wrong time, or spent in the wrong way can easily be detrimental). We must also be modest in our ambitions e.g. small landlocked countries without natural resources just don't have good prospects for economic growth unless (like Switzerland) their neighbours first i) get rich and ii) help build regional transport infrastructure . As a 'hard-nosed' political economist Collier focusses on economic growth, since that is plausibly necessary if not sufficient for development. What an economist philosopher like Amartya Sen would add is a more comprehensive idea of the human development that economic growth is desirable in order to pay for - for example, a country doesn't have to wait until it is rich to start saving its children from disease and illiteracy. But that is another debate.